The Gruntz templates for area damage, short and long spray type weapons and the ruler which has the short and long movments for Gruntz troops (8nches and 4inches) has been uploaded as a paper print copy in the Wargames Vault. You can also purchase these same templates in fine laser cut acrylic from the Sarissa store here: http://www.sarissa-precision.co.uk/store/gruntz/ I know I prefer the acrylic versions because you can see through them to the figures below, however if you wanted something quick and easy to use, printing the paper version is ideal. Please also note that when you print the paper templates that you should not use the "resize to fit page" option. If you do the sizes will be reduced. 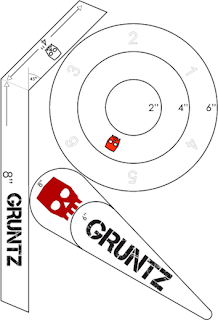 Which of the Gruntz files were these templates added too? I have just re-loaded this again. It should be on-line tomorrow.